I think we have all been raised to be honest, to always tell the truth. Since childhood we’ve been told the stories of store keeper Abraham Lincoln being meticulous about not taking advantage of his customers and the honesty of George Washington who got carried away with his new little hatchet and cut down his father’s cherry tree. We understand what honesty and truthfulness is. And most of us probably try to be honest and truthful. But somewhere along the line some of us started to modify our commitment to honesty. Somehow being honest became more of a matter of convenience, a matter of expediency. It started small, maybe with just a slight exaggeration or a small bit of non-disclosure. We began to tell ourselves that it’s not really a “lie” and that, in the grand scheme of things, it doesn’t really matter. “It’s just a small white lie….”. Then we would search our mind and come up with a variety of justifications and rationalizations and the guilt or uneasiness would go away. Eventually we became so used to little whites lies that we stopped noticing. In time it became easier and easier to “stretch” the truth or tweak it a little bit here and there to smooth the situation or enhance it. But this is dangerous and little white lies can grow and evolve into a hard wired way of thinking, creating a serious disconnect from reality. You can never be free living with deceit. It works to undermine you and if not eliminated can expand into something much darker. At our core we know what is wrong and right. We cannot be free if we carry one little bit of guilt or have any misgivings. About anything. 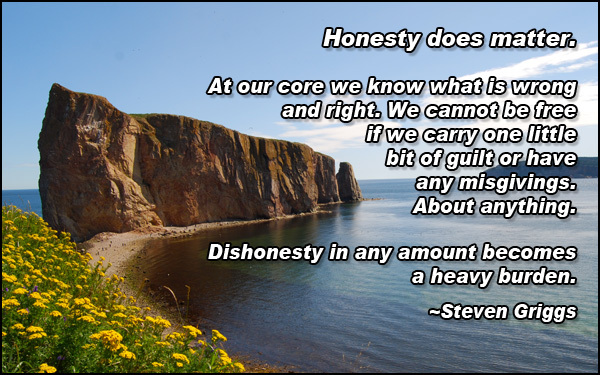 Dishonesty in any amount becomes a heavy burden. Integrity starts within you. You have to become totally honest with yourself if you are to ever be honest with anyone else. What do you do? How do you start? This is tricky because we are so used to lying to ourselves that we don’t even know we’re doing it. How many people keep their New Year’s resolutions? No one keeps their resolutions and no one expects you to keep yours. It’s almost like a national agreement to lie to ourselves. How many diets have we all started? How long did you last? Several months, a few weeks or several days? Again, not keeping our promises is almost accepted as normal behavior. So, again, it all starts with you. You must begin the habit of keeping every promise you make to yourself. You might not be used to having conversations with yourself but you must stop saying things to yourself just because it sounds good or to appease your guilt. “I'll start tomorrow....” or “I don't feel good today, I'll start next week...". Who are you fooling? You are simply soothing your ego mind. It wants everything now with no effort. So you have to stop the lying. You have to stop being wishy-washy and flaky. Don’t say it if you can’t do it. If you can’t do it or aren’t able to right now, fine. Tell yourself I’m not ready yet. This can begin the dialogue. You are being honest with yourself. When you are ready then commit and keep your promise. Get off the cycle of promises not kept. Get real with yourself and start meaning what you say. Commit to start today. The past doesn’t matter nor does the future. It’s just now. From now on do not make any promise to yourself that you aren’t prepared to keep. This is the first step to becoming a person of integrity. Eventually this personal mantra will expand into your dealings with everyone else. Build integrity, keep your promises. This is a huge step towards being free.